Skincare products that are meant to hydrate to the max, filled with all the good stuff, and even perfect for sensitive skin? Sounds like a myth. Being a girl with both oily and extremely sensitive skin, I’ve tried countless skincare products and have been left disappointed with how they’ve left my skin looking, and feeling, over and over again. 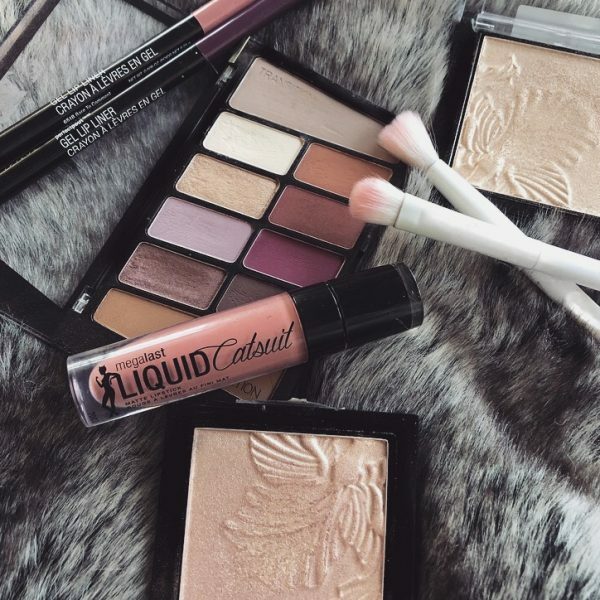 But sometimes you come across a miracle product, or two, that change your once predominately negative opinions about skincare as a whole..
Before I continue, I was lucky enough to be gifted these products to review from Influenster. 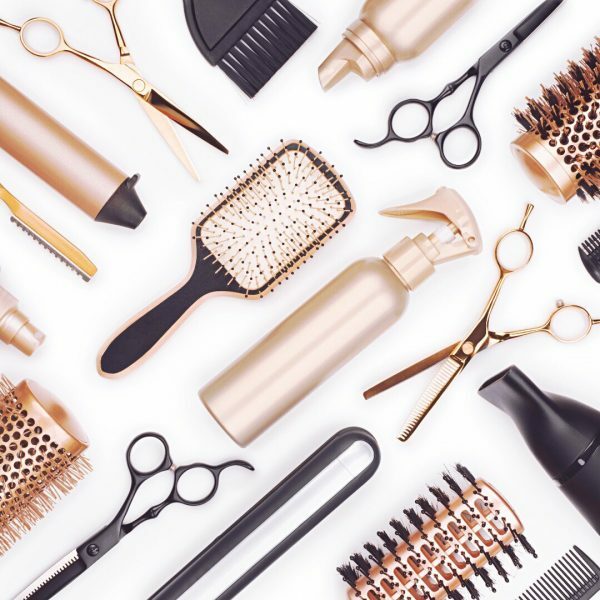 If you don’t know already, Influenster is a platform where you can discover and review literally every product in the world. The coolest part though, you can actually receive products to review yourself from Influenster, and you don’t even have to have a blog! Interested in joining? Head on over to Influenster.com and get started! Although I received these products complimentary, all views remain my own. This post may contain affiliate links. If you make a purchase through these links, Alexandra Quinlann will receive a commission by referring you, at no extra cost to you! You can read more about affiliates in my disclaimer. Thank you so much for your support! 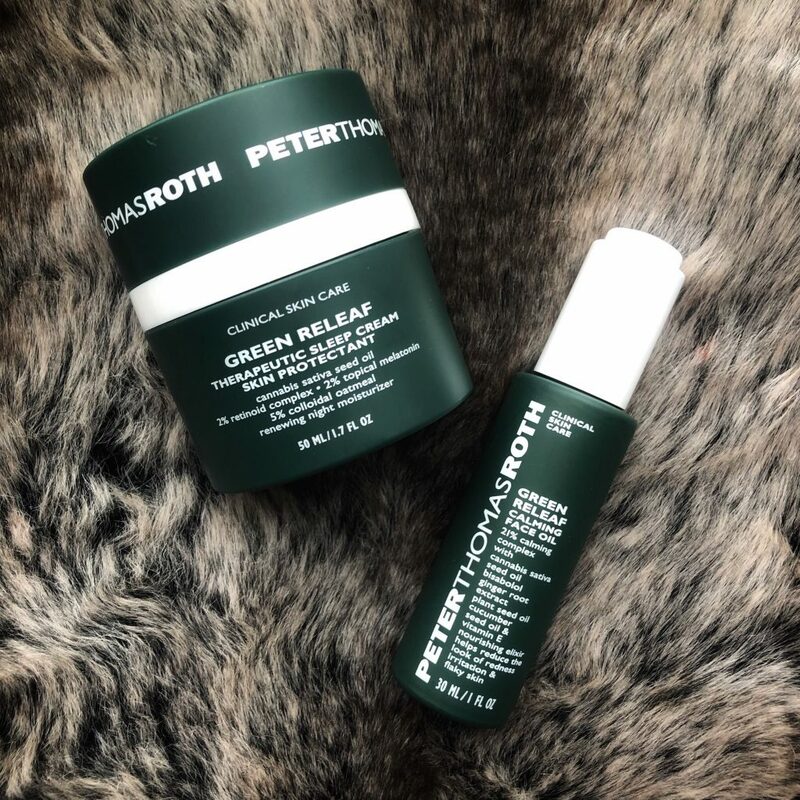 The Peter Thomas Roth Green Releaf Collection includes the Green Releaf Therapeutic Sleep Cream and the Green Releaf Calming Face Oil. This collection boasts smoother, calmer, and more hydrated skin. In sleek and beautifully unique green packaging, (which I am in love with), these products fall on the more expensive side at $65 for the sleep cream and $68 for the face oil. Both products in the Green Releaf Collection contain no alcohols or fragrances and have a little something called Cannabis Sativa Seed Oil, which is rich in vitamins, minerals, and antioxidants, and is supposed to help calm the look of redness and leave skin appearing smoother, younger, and more moisturized. It also claims to be for all skin types, including sensitive. But does it actually work tho..? Let’s break it down. This nighttime moisturizer is packed with all the good stuff. 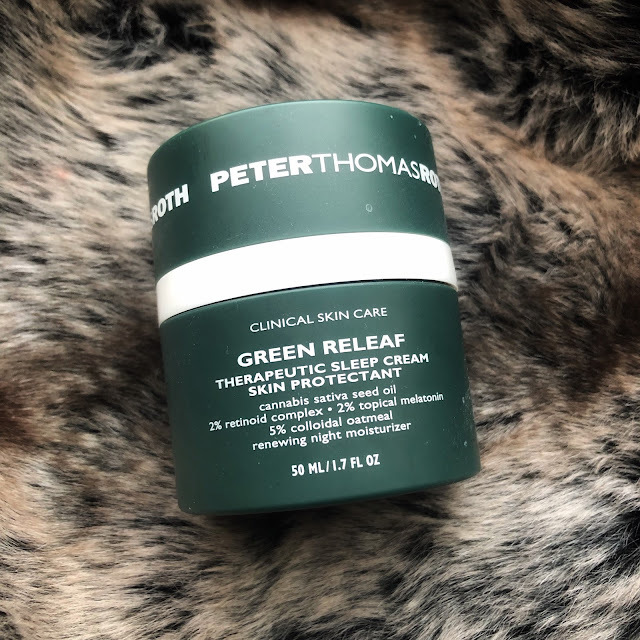 The Peter Thomas Roth Green Releaf Therapeutic Sleep Cream contains a 2% Retinoid Complex, which helps smooth fine lines, wrinkles, and uneven skin tone. 2% Topical Melatonin, (something I’ve never heard of before), claims to help improve skin’s overall appearance overnight, and of course the Cannabis Sativa Seed Oil. It also contains Vitamin E-rich butters and oils to help keep skin hydrated and moisturized. This sleep cream works so well with my oily skin. It’s hydrating without making skin feel like an oil slick and it even contains Collodial Oatmeal, which is great for skin that gets itchy due to dryness, eczema, or other skin conditions, making this product a serious game-changer for those with both oily and sensitive skin, (aka me). Nothing makes a person with oily skin cringe more than the idea of slabbing more oil on their skin. But face oils are important for all skin types, including oily. Oils help keep your skin moisturized and can keep your skin looking smooth and youthful. The big problem is, some oils are just too oily. But good news! This one isn’t. The Green Releaf Calming Face Oil is packed with all of the good oils including, cucumber, avocado, grape seed, and the above mentioned Cannabis Sativa Seed Oil. And it gives your skin the absolute perfect amount of hydration. It absorbs well, and doesn’t sit on your skin like other oils can do. The first time I used it, I found it was slightly too oily for me, but after adjusting the amount I use, (you really only need a little), and allowing my skin the time to get used to it, I’ve found that it’s been the best addition to my nighttime skincare routine. After using it for a few weeks, I’ve noticed that my skin looks smoother, brighter, and just..nicer. Just like the Green Releaf Therapeutic Sleep Cream, this oil also doesn’t contain any alcohols or fragrances, and is packed with nothing but the good stuff, making it another product perfect for all skin types, especially sensitive. The only downside I’ve found, and this is a personal thing, but it doesn’t work well for me when I use it under my makeup. I’ve found that it causes my skin to appear too oily, and my makeup doesn’t stay on throughout the day. But no worries, I just use it every night. 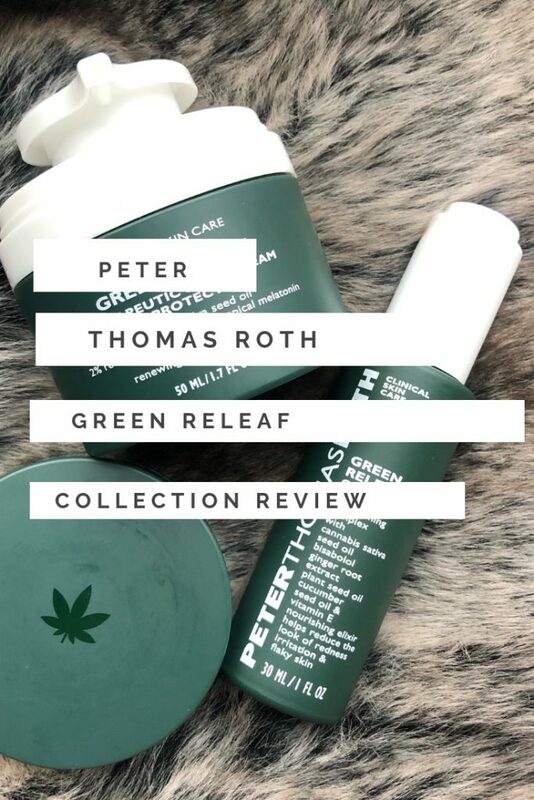 Although at a higher price point, the Peter Thomas Roth Green Releaf Collection is fully worth it in my opinion. You don’t need to use a large amount, and the package size is generous, so the product is sure to last a while. 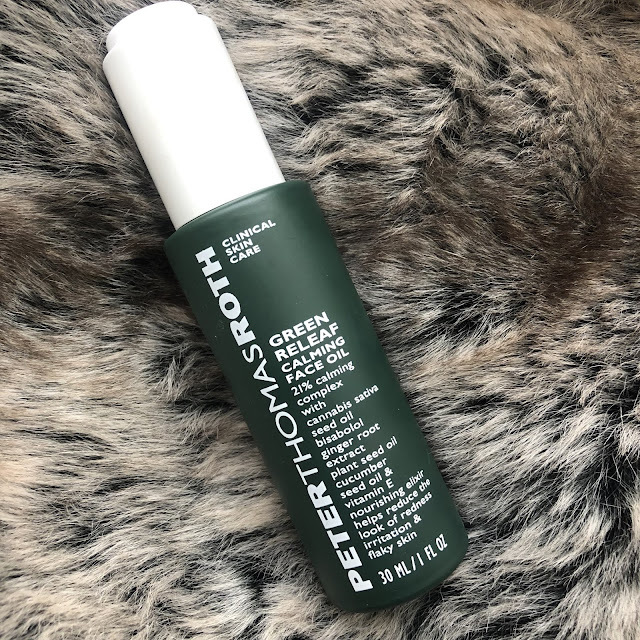 All in all the Peter Thomas Roth Green Releaf Therapeutic Sleep Cream and Calming Face Oil are two products that would make a great addition to any skincare routine. Filled with quality ingredients, and not filled with nasty alcohols or fragrances, these skincare products are perfect for all skin types, including sensitive skin. Believe me when I say, my skin has never looked better, and I’m so happy I’ve discovered two awesome new products to add to my routine! 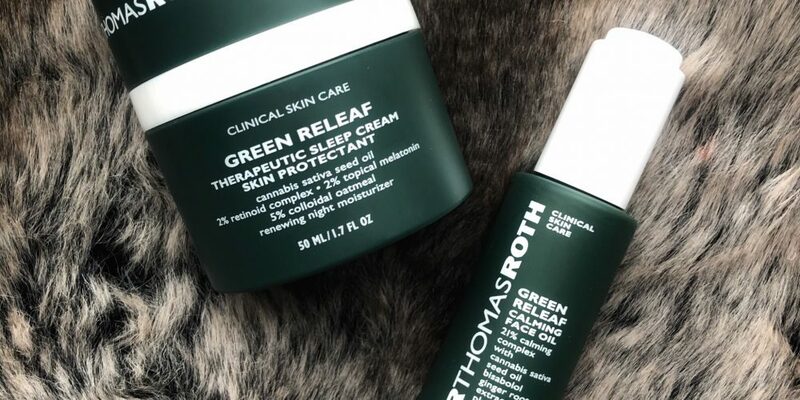 Have you tried the Peter Thomas Roth Green Releaf Collection? Lovely post! I also have sensitive skin, so it's really hard to find products my face also likes. I hope I can invest in this face oil soon because I've never tried one. I am always looking for reviews on great skin care products. I will be looking into the oil, as it sounds like something that would be great for my combo skin. Thanks! This is definitely the face oil to go for, especially if you have sensitive skin. I've tried so many different products, and although this one is a little more pricey, it outperforms the others by a lot. I highly recommend it! My skin is oily, but this winter it's been leaning more towards combo and this oil has been the perfect thing for adding just the right amount of moisture without making my skin feel oily!